Likewise, the PTI, citing Sri Lankan High Commission sources, reported on Thursday that the Indian President Pranab Mukherjee complimented Rajapaksa for Sri Lanka’s ‘economic progress’. Speaking to media during his arrest, Mr. Vaiko said that "We will never forget the BJP government of Madhya Pradesh." He further outlined three action plans that the MDMK intended on pursuing in the immediate future. He said that the MDMK will embargo the Indian Prime Minister's residence, they would campaign in every state capital, and that they would distribute vernacular language versions of the genocide of Eezham Tamils all over India. 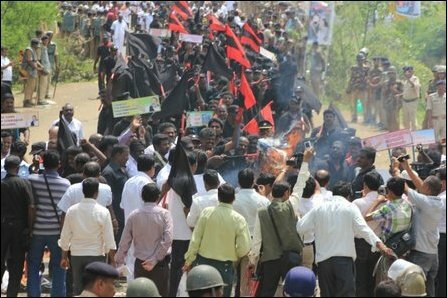 Prior to their arrest, effigies of the SL President were burnt by the MDMK activists at the Badhchicholi village where they had been stopped by the Madhya Pradesh police from entering the state. Also, villagers from hamlets nearby joined the protestors. Hindi CDs on the genocide of the Eezham Tamils were circulated by the MDMK activists. Also, a few MDMK activists who managed to reach Bhopal through other transportation were arrested by the state’s police there. Numerous protests have been erupting across Tamil Nadu as well. Over 10000 cadres of Tamizhaga Vaazhvurimai Katchi (TVK) staged a rail blockade demonstration at Kadaloor (Cuddalore) on Thursday. Activists of the party staged similar demonstrations on all major rail routes in Tamil Nadu. Over 2000 of the TVK’s cadres along with leaders Velmurugan and Prof. Dheeran, Porur Shanmugam, and Kamarajar were arrested for demonstrating in front of Chennai Central station today. Hundreds of activists of the Viduthalai Chiruthaigal Katchi and their leader Thol. 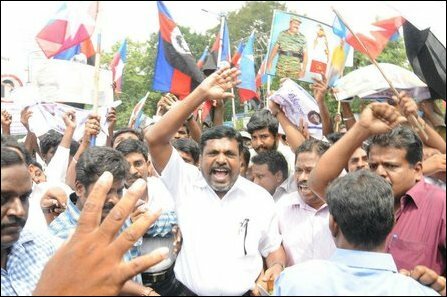 Thirumavalavan were arrested and temporarily detained as they tried to gherao the Sri Lankan Deputy High Commission in Chennai. Sri Lankan flags were also burnt by the VCK protestors. 21.09.12 Protests intensify against Rajapaksa’s presence in..
19.09.12 Self-immolation protestor dies, anti-Rajapaksa agi..
17.09.12 Tamil Nadu activist attempts self-immolation to pr..